apple cider vinegar | What's Green with Betsy?!? Ah, summer is here at last and so are the mosquitoes. After a very rainy spring, they are out in full force. 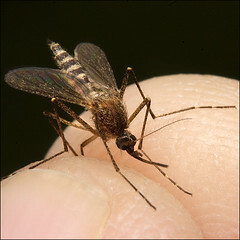 There are several precautions you can take to repel mosquitoes, like using a safe, non-toxic personal repellant, covering your arms and legs at dusk when the mosquitoes come out, avoid keeping standing water around in birdbaths or buckets, and placing certain aromatic plants like scented geraniums, marigolds or rosemary on your patio or deck or in your garden to help repel them. But, even with these precautions, most of us will usually get bitten, and some people more than others. I know I am a mosquito magnet – my husband says when he is with me, he never gets bitten! So, what non-toxic relief can you get for those nasty, itchy, inflamed bites? Lots! Below is a list of common household products, which relieve itching and help to heal the bite. Mouthwash – soak a cotton ball and dab it on the bite. An antiseptic mouthwash will prevent bites from becoming infected. Salt – Moisten first then rub table salt on the area. Aloe relieves the itch and heals the wound. Lemon is good when you just have to scratch. Cut it in half and use the pulp side. Helps reduce the chance of infection from scratching. Deodorant – Rub on immediately after getting the bite to reduce inflammation. Lavender, tea tree, peppermint, eucalyptus, basil, thyme or neem base essential oils (just a drop or two) reduce inflammation and prevent infection. Apply to affected areas several times a day. Garlic salt and seasoning salt mixed with an equal amount of water. An ice cube applied directly to the bite will numb the pain and reduce inflammation. Mud – if you are outdoors without access to the above mentioned cures, a bit of dirt and water mixed together is effective at relieving irritation and reducing swelling. Each remedy works better for some people than others. When you get your next bite, try some and let me know which remedies work for you. Information compiled from www.home-remedy.org, Organic Body Care Recipes by Stephanie Tourles and www.care2.com/greenliving/7-ways-to-treat-bug-bites.